Student Jasmeet Singh Sasan sledding for the first time. He is one of many students who join Lindsay Ziegenhorn and her family for Thanksgiving and outings throughout the year. This Thanksgiving, families across the nation will gather to prepare food and make memories. Yet for some Illinois State students, home is thousands of miles away, and Thanksgiving is a foreign concept. Enter Lindsay Ziegenhorn and her family. For the third year in a row, the Ziegenhorns will open their home to students for a Thanksgiving feast. 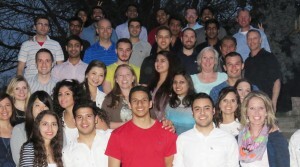 It is just one of many days the Ziegenhorns celebrate with international students. For the past three years, the Ziegenhorns have provided dinners, outings, and emotional support for a wide array of international students. Yet none of it was planned, said Ziegenhorn, a staff nurse at Student Health Services. Ziegenhorn and her husband always wanted a large family, but found it wasn’t meant to be. “We were blessed with two wonderful daughters, but we always felt the four of us were meant for something larger,” she said. Students gathered at the home of Lindsay Ziegenhorn and her family for Thanksgiving. The dinners evolved as more students made their way to the Ziegenhorn home. Soon they were having dinner to celebrate holidays from Morocco, India, Azerbaijan, and Saudi Arabia. In many ways, Ziegenhorn feels the dinners break down misconceptions between cultures. “Students can return to their own countries and share their experience of spending time with American families,” she said. 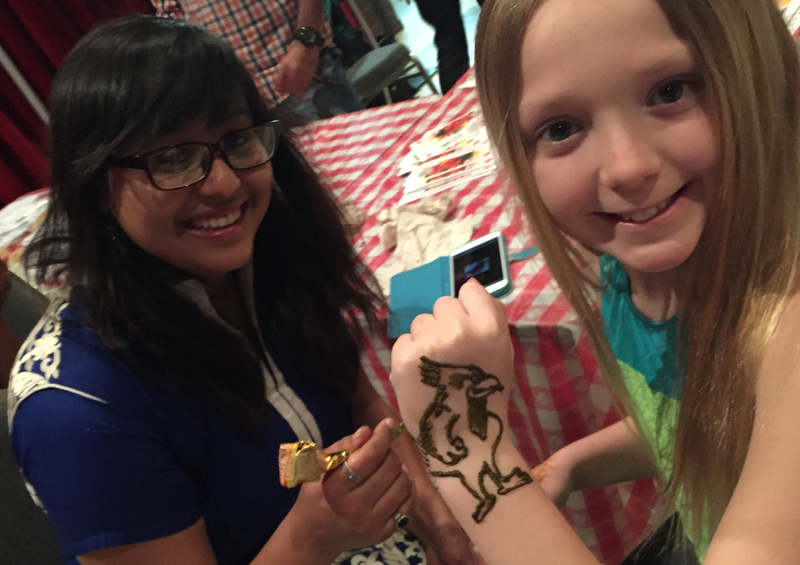 Zoe Ziegenhorn, 10, asked for henna in the shape of Reggie Redbird at the 2015 IFair from student Nidhi Kothari. Along with food, the Ziegenhorns plan small trips, such as sledding at a golf course over holiday break. “Watching a young man from India—who has never seen snow—slide down the hill that first time; it was magical,” she said.